DETROIT -- Jaguar Cars Ltd., which stopped reporting sales figures after being purchased by Indias Tata Motors in June, said global sales rose 8 percent last year while U.S. volume fell. 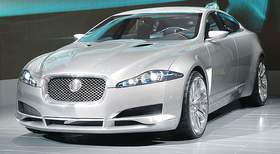 Jaguar sold 65,000 vehicles in 2008, Managing Director Mike ODriscoll said in an interview at the Detroit auto show. Volume in the United States fell to 15,500, he said. In 2007, Jaguar posted 15,683 U.S. sales as a unit of Ford Motor Co.
Gary Temple, CEO of Jaguar Land Rover North America, said the company expects Jaguar demand to be flat this year. U.S. sales industrywide fell 18.0 percent last year, and analysts expect further declines in 2009. Jaguars U.S. sales have plunged 75 percent since a peak of 61,204 reached six years ago under Ford. Along the way, the United Kingdom has overtaken the United States as Jaguars biggest market. The brand will continue to get a boost from the $50,00 XF flagship sedan, which was launched in various markets in the first half of 2008, ODriscoll said. In March, Jaguar will add a high-performance XFR sedan and XKR coupe, said ODriscoll. Prices for those 2010 models have not been announced.